Learn more about the exciting ownership opportunity in the brand new Margaritaville Resort Orlando. 1 - 8 bedroom cottages from $300,000. Margaritaville Resort Orlando will become your little piece of paradise. Situated in the heart of Kissimmee and located less than 3 miles away from Disney along the popular 192 highway. Margaritaville Orlando offers you the incredible opportunity to own a piece of this amazing resort. 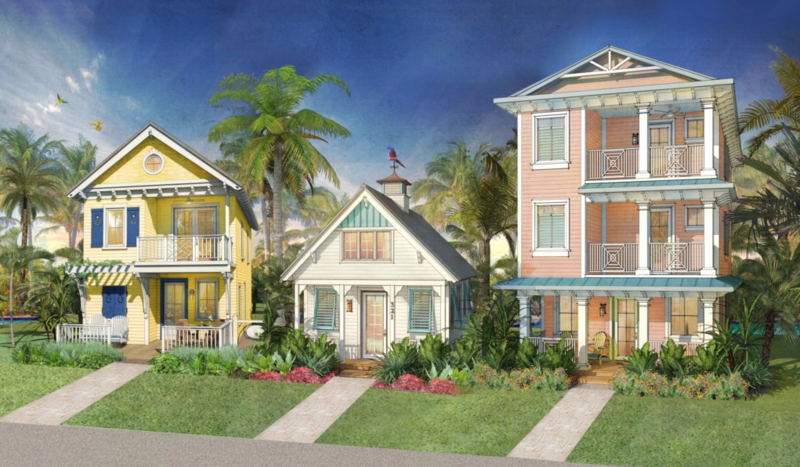 Stunning 1 - 8 bedroom Key West style cottages are available in one, two and three level designs. With inspiration coming from the coastlines of popular islands each cottage will be painted with dominant colors such as pink, yellow, aqua and white. Stay when you like and rent out your home when you are not here. Margaritaville Resort Orlando is spread over 300 acres of prime real estate here in Kissimmee, the resort will feature 1000 vacation homes, 300 timeshare units and a 187 room hotel. To keep all the guests entertained during there stay Margaritaville has some incredible on-site amenities that will be available to you as a homeowner and your guests. Its always Happy Hour somewhere at Margaritaville Resort Orlando try out our four on-site distinctive dining and lounge experiences that caters to everyones desire. Euphoria - Euphoria is a stunning upscale dining experience with open air kitchen and lively lounge. Open for resort guests and local this laid back luxury dining experience is no doubt going to be a hit. Euphoria offers an excellent selection of seasonal dishes making it perfect for large groups of for a romantic get away. On Vacation - Our casual dining restaurant and coffee bar, wake up early and grab a freshly brewed cup of coffee and breakfast bite. On Vacation offers breakfast, lunch and dinning in a casual family friendly setting. Salty Rim Bar and Grill - Our pool side grill and bar is perfect for working on your tan whilst sipping on one of our famous frosty margaritas and enjoying a hamburger or hot dog. Salty Rim Bar and Grill serves drinks and food daily all whilst over looking the stunning pool. Provisions - Coffee shop and grab and go snack bar. Grab a sandwich, wraps and sandwich and cold beverages on the go. Or enjoy a delicious coffee to start your morning off right. Choose from a selection of stunning floor plans ranging from 1 bedroom cottage to 8 bedroom homes, all have full access to the on-site hotel and lagoon pool as well as the public water park. Margaritaville is located in a prime position to benefit from Orlando’s booming vacation rental market. Margaritaville has also created a stunning “Sunset walk” where you will find 196,000 square feet of of retail with live music venues and a state-of-the-art movie theatre, & Serpentine boardwalk to Dining and Entertainment District. The Margaritaville Resort Water Park is set over 14 acres and will be opening in spring of 2019. The water park will feature nine thrill rides including three separate water slide towers, a wave action pool, river ride, private cabanas and kids water park area. Throughout the park is beverage stations and dining options. The water park is located next to H20 Live and live music venue. Sunset Walk is a brand new entertainment district set amongst the stunning Margaritaville Resort Orlando. Filled with fantastic restaurants, burger joints, live entertainment and fun family friendly bars, Sunset Walk will have something for everyone.